*Disclosure: This post is part of the Campbell’s Wisest Kid campaign. I am a paid spokes-blogger. As always, opinions and pie selection crisis are my own. This Thanksgiving, our family will spend the morning watching the parade at our house, and then we will enjoy a feast with my mom and stepdad, and then another with my dad and stepmom. Stuffed, much? I’m in charge of the pies this year. I currently have 5 pies on my list…maybe 6…still debating. I’m stuffed just thinking about this now! Ryan (age 8) – Minecraft and riding bikes in the park. Charlie (age 6) – my baby brother (awe!!!) and Minecraft. Thanksgiving meal times for us will be random this year, so I’m going to try something new. I’m going to set out a few plates of “mini-snacks” for the kids to graze on throughout the day, as they are waiting for the big meals. Every year, they are pulling on my pant legs asking for food since we don’t eat at “normal times”…so I’m going to be ahead of the game this year and have some finger foods ready for them! 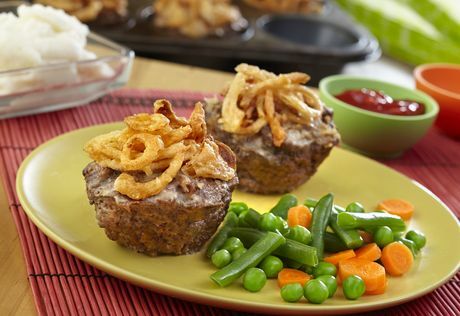 Mini-meatloaves with french fried onions on top…FTW! What are your kids thankful for this year? Do you have any “gratitude traditions” that your family does each Thanksgiving? You don’t home school, right? Thanks for an easy dinner idea. Giving it a try tonight.